This is at Eisenhower State Park. It was so cool! Do you ever have those times in your life when you have so much to say, and so much overwhelming stuff going on that you don't know *what* to say? Now is one of those times for me. So that's why, I suppose, I haven't blogged that much. I feel strong and confident about my future and am resting in the Lord's grace and love (trying to feel His love is a challenge for me so I'm working on that). Christmas was, well, Christmas. I did get to go to Chuck Swindoll's Stonebriar Community Church in Frisco, Texas on Christmas Eve! It was cool to see the man with his voice in person. The service was only 30 minutes long and all he and another guy on the stage did was to read the Christmas story interspersed with Christmas songs. It was not all that spectacular to me. I wanted to go to his service on the following Sunday, but that was not a great day... nuf said. And then I went up to North Texas for a travel piece I'm doing on Lake Texoma. It was cold but fun! I stayed the first night at the Rancho Sereno Bed & Breakfast, which is run by a couple who raise reining horses. The Red River Valley area of Texas is like the world's headquarter's for raising and training horses for competitive events like reining, because of the sandy loam soil. I am not a big horse person myself, but it was really interesting, and a beautiful place to stay. The next two nights I got a tower room at Tanglewood Resort, a place that has been around since the 1940s! The tower is a 7-story "tower" and each room is its own suite with a 360-degree view. At the top is a lounge where people can hang out with a great view of the lake. I think the best part was the awesome massage I got while there at the Tranquility Spa! The owner, Johanna, creates all the products herself and I got a couple of the bath salts and they smell AMAZING and the prices very reasonable. She apparently has a new line of organic baby care products coming out too. Not that I need that! 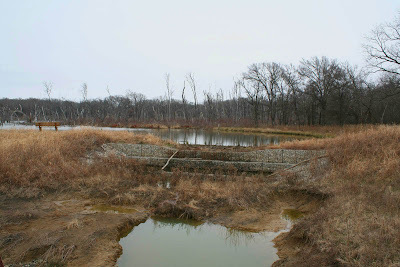 While staying in North Texas, I went birdwatching at Hagerman National Wildlife Refuge (we saw quite a bit! ), and went out on Lake Texoma in frigid weather with awesome fishing guide Chris with Striper Express - he knew exactly where the fish were! See the pic below with a ginormous striped bass and yours truly. OK I didn't catch it, but still... Then we ate some yummy food at De Happy Cajun Restaurant. I also stopped in at Eisenhower State Park - which is absolutely gorgeous. I didn't expect that. 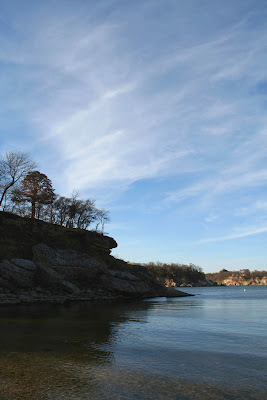 The lake - which is on the border between Texas and Oklahoma and is a reservoir of the Red River - has these rugged cliff faces and rocky ledges you can climb around on at the state park and I explored around and sat watching the water in this one beautiful spot. The area has a lot of history too. And now I'm back home and trying to have an incredibly productive January! While doing the Inner Mean Girl Cleanse, I "won" a 12-week goal setting course through Amy Ahler's Wake Up Call Coaching so I'm on week 1 now. I've set some goals for my new year in all areas of my life! I'll share some of those soon. Our first exercise was to address where we are thriving and where we are merely "surviving" - and I was happy to say that in most of the areas of my life I am thriving! I am very grateful for that. My main goals have to do with breaking through the glass ceiling in the writing world (there are some prominent magazines I plan to start pitching and would like to break into), and in the financial realm as well. I also want to make sure to spend more time with my amazing children and to cherish these next 2 and 3 years they are home with me before going off to college (sad face). I am soooo proud of them! Both of them are in the top 1% of their classes! My daughter got chosen as team captain by her coach because she saw that Savi exhibited leadership skills - even though this is only her first year on the team. I saw her first home game tonight and it was freeezing cold but it was so cute seeing her out there playing and telling other players where to go on the field. :) And they won 4 to 1!! This is the house that President Eisenhower grew up in. Notice the "white picket fence" - I wonder if it was actually white when he lived here? This is one of two cabins at Rancho Sereno. One of the horsies at Rancho Sereno. Inside the rooms at Rancho Sereno. The photograph on the wall is of horses from the ranch. This is a relatively dull shot of the scenery at Hagerman NWR. It was grey day, so nothing is vibrant but the birds were out in droves. A pretty ginormous striped bass on Lake Texoma!